We are finally enjoying some higher temperatures; the sun is shining and the BBQ has been out on the days when the rain stays away. Hopefully, there will be plenty more sunshine on the way as we approach the summer. 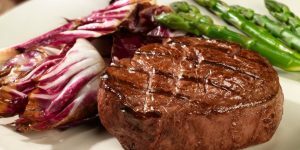 Hereford beef is delicious all year round so we’ve picked out three easy summer beef recipes for you to try with your favourite cuts of beef. These recipes are ideal for replacing those warming beef stews and traditional roast dinners. We all love a quick and easy recipe and this stir-fried beef is ready to eat in less than 30 minutes. This is the perfect dish for the days that you don’t want to spend slaving away in the kitchen. Ask your butcher for 2 x 200g of Hereford beef sirloin steaks, trimmed of the fat and thinly sliced ready to add to the pan. The recipe serves 4 people and each serving is 311 kcals. Find the full list of ingredients and the cooking method, here. Serve our Alfresco Hereford beef as a replacement for Sunday dinner (or any roast dinner in the week). The recipe requires 1.3kg lean topside, silverside or sirloin Hereford beef joint. The beef is marinated in rose wine and herbs and served with some red onions and roasted garlic. Serve up to 6 people or have enough for leftovers during the week. Click here for the Hereford beef recipe. This classic recipe for rib-eye beef with polenta chips comes from Robert Thompson. You’ll need to ask your butcher for 1000g of rib eye Hereford beef steak to serve 4 people. This is an easy recipe but the sauce does require some time, but it’s worth it. Find the recipe, here. Do you have a favourite summer beef recipe? Share yours with us over on our Facebook page.